Ventriloquists have long been underdogs in the world of entertainment and Dumbstruck, the new documentary by producer/director team Lindsay and Mark Goffman, explores the lives of a handful of people who live by the dummy. 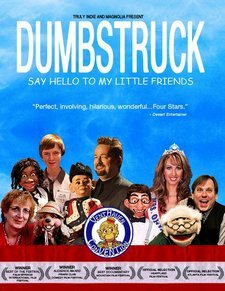 The camera follows five ventriloquists with a range of experience and success, from 13-year-old beginner Dylan Burdette to die-hards like former beauty queen Kim Yeager and Wilma Swartz to success stories like veteran Dan Horn and America’s Got Talent winner Terry Fator as they live the ups and downs of their passion. The film really succeeds in its ability to keep the focus on its group of diverse and interesting characters and not simply document their acts (even though there are some surprising and brilliant performances by Horn and Fator) and what comes to light are the similarities, notably the struggles, of all the performers. In fact, the film is as much about the lack of support these performers have dealt with from parents and family as it is about ventriloquism and even the rags-to-riches story of Terry Fator who ends up signing the biggest deal in Vegas history ends with a pang of the heart after his father fails to show at his hometown performance. One of the most poignant scenes in the film is it’s last in which the camera pans over to a room full of jugglers for a brief word giving the film a great sense of context and underscoring why it’s interesting and entertaining even if you have no interest in ventriloquism.